Breakdown voltage 40 VAC / 55 VDC per radial .001" of glass between header and electrode. Insulation resistance ranges @ 500VDC > 50 MΩ. Hermetic Seals can be provided in an extremely wide variety of materials which add corrosion resistance, improve solderability and enhance electrical performance to meet the requirements of the most demanding application. 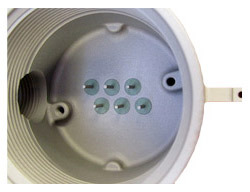 Various plating materials are available with either electroless (immersion) coatings or electrolytic selective plating. The simplest seal comprises an outer body called a grommet, the insulating sealing medium (the glass) and the center pin or electrode. Without the electrode and using special glass the seal can be used as a sight glass. Glass Bead: ID and OD determined by application, wall thickness limit: 0.38mm. We currently have a wide selection of standard beads. Electrodes - 52NiFe Alloy provides proper expansion characteristics. Pre-Sealing Component Preparation Process – Grommets & Electrodes: Aqueous wash, dry, furnace anneal. Firing and Sealing: Components are then loaded onto Graphite fixtures. The fixtures are loaded onto the furnace pallet and placed into the vacuum furnace. Heating takes place in our computer controlled, vacuum furnace (pre-programmed with appropriate parameters). Quality Control: The fixtures are unloaded. Seals are inspected visually, followed by extensive sample assessment using our exacting testing equipment, all prior to being counted into our finished inventory. 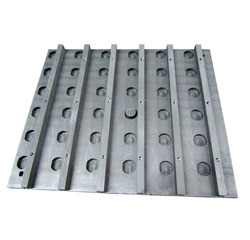 Electrodes can be plated selectively with specialized racks. Entire seals can be processed. Plating materials can include Nickel, Copper, Silver or Gold. Plating to specific thicknesses or special finishes is also possible. Please contact us at the number below if you would like to know more about our Hermetic Seals.